The Midas is a high quality, very practical, small car built to suit the needs of each owner. Cars are available either new, ready assembled, or in kit form from Alternative Cars Ltd (see contact information), or from the second hand market. The design is based on a very strong composite monocoque body shell onto which are assembled the suspension, power train, and all mechanical and electrical components from the Rover 100, Metro or Mini series of cars (dependent upon model). The design is thus very simple, strong and long lasting, and uses reliable, easily maintained and available parts. The car offers a rewarding, sporty driving experience, with performance dependent on the engine option fitted. We find that many members of our Club buy a Midas to experience the driving pleasure that can no longer be experienced in the modern family car, whilst providing practical daily transport at very reasonable cost. It is of particular note that several Club members have recently re-joined the Midas world, having regretfully left it a few years ago because of a growing family. The first Mini based Midas cars were introduced in 1978 and the marque has been steadily developed over the years to include both coupe and convertible body styles, and to introduce the more advanced technology Rover K Series power units. See the attached brief history of Midas cars. 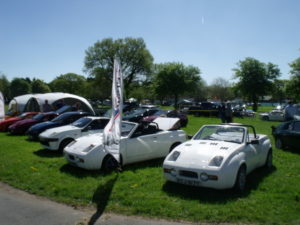 The Club was formed in 1985 by Colin Spencer to promote interest in Midas cars and provide information to Midas owners. Membership from year to year usually stands at about 200, including several overseas. We arrange a Midas parking area at most of the major kit car events each year, and an Annual General Meeting is held, often in conjunction with a factory visit to Midas Cars Ltd at Clanfield. Newsletters are sent out to keep members up to date with Club events, and a Club magazine ‘That Golden Touch’ is used to communicate information on the experiences of members with their cars, useful hints and tips etc. The attached Club constitution gives full details of how the Club and committee operates. Our annual membership fee is a very reasonable £20, and a summary of the benefits of Club membership, including insurance discounts, and an application form are attached. A range of Club accessories is also available, see list.